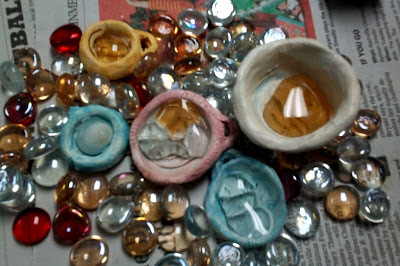 My friend Janet ( msmalonesartroom.blogspot.com ) & I were discussing if we could use glass marbles/beads/etc with our clay lessons. I don't tend to glaze because of the time/cost of it with the number of children I see. Sometimes I'll use underglaze and did projects, but usually I just use acrylic with the kids. Anyways, I made a bunch of little pieces over break so I could give it a try. Some pieces I did not do a glaze on....some I glazed and laid the glass on top...others I glazed & then put the glaze on top of the glass pieces as well. The melting of the glass is very irregular. The color burned out of some...and the orangish colored ones were red glass. The ones I did not glaze at all...some of the glass popped out. The ones I placed glaze over top of the glass....have a film over them. Janet is going to try some other things...and will post her results as well (right Janet?). I'm not saying I won't try this with the kids, but I'm not sold on it either. WORTH A TRY!!! Had fun doing it. Ok mr e. what cone are you firing to? That might be some of the problem. You might want to try different types of glass as well. Maybe smaller pieces. I did a little of this back in my college ceramic days but it wasn't really my thing. But it dose work. Try marbles. Or broken up glass bottles. I will tell you this. Blue works really good. Red is a tricky one b/c it must likly has copper in it. And that stuff is tricky to keep red. It is all about temp. But if you are making stuff with the kids I understand the one firing. 2. What I do is we paint are stuff with tempura cakes or water colors after they have been fired. Then if you like put some thing to seal it all up or not. Either way they look great. Last year I made pinch pot bird baths (as seen in numerous pinterest posts). After the bisque firing, we under-glazed them and then put a clear coat glaze over the top. When I loaded these in the kiln for the glaze firing, I added 3-4 flat blue marbles (from the dollar store) to each bird bath. They turned out excellent. The glass did have some cracks through them here and there, but no other problems! Thanks Mr. R.....I had 2 levels of Ceramics in college & did a lot with glaze creation and such. I know reds are pains....but found it interesting it turned that orange ish peach color!!! :) It is so much about time in elementary. I see over 100 students in a given grade level. If you glaze things...you can't fill a kiln with more than 1 or 2 classes...and I have 5 or 6 of each grade level. IT WOULD TAKE FOREVER. I use acrylic to paint mine with...sometimes put tempera varnish over top. @Mrs. Impey I don't remember seeing them on Pinterest. Sounds neat though. I usually use small pieces from glass bottles I am recycling. The key to firing glass, though, is that it only needs to fire up to about 1500 degrees and then cool really slowly. The lower temp will help preserve the glass colors. It will sometimes still crack due to different shrinking rates - but if you leave until room temperature the results will be better! This would be fun to work with students just to show how much a kiln can effect some things. I've many-a-time had a project go in with a glaze and because of various reasons, it doesn't turn out exactly like the student planned. You could have students brainstorm about what they think should happen - and then discuss what really happened. Kind've prepare them for situations where they might have to wait for results. I've done this with other projects and because it's not their own project, students love talking about all the reasons - and it helps them understand that sometimes, our projects don't always turn out how we see them in our head. What a fun experiment - makes me want to try it!